Unfortunately, accrued sick leave is sometimes not enough to cover an unexpected or prolonged illness. For this reason, UFHR offers a Sick Leave Pool as a way for employees to combine a portion of their individually accrued sick leave for collective use. Members of the Sick Leave Pool may draw upon the pool — with approval from the Sick Leave Pool Committee — when all individually accrued leave hours have been depleted due to personal, not family, catastrophic injury or illness. Membership in the pool is also a great way to help fellow employees in need. All faculty, TEAMS and USPS employees who earn sick leave are eligible to participate in the Sick Leave Pool. Full-time employees must have a minimum balance of 64 hours of sick leave to join. Once the membership application is approved, an eight-hour sick leave contribution will be automatically deducted from the employee’s sick leave balance. This is a one-time contribution of eight hours unless the total available hours in the pool drops below the minimum level set by the Sick Leave Pool policy. The minimum balance requirement and hours contributed are pro-rated for part-time employees. Qualifying UF employees may apply for membership in the Sick Leave Pool during its open enrollment period from Oct. 1 to 31. 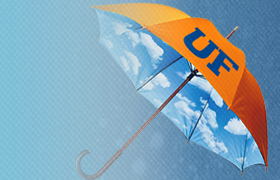 Applications must be received by UFHR Benefits by 5 p.m. on Wednesday, Oct. 31. The application can be found here, and current members of the Sick Leave Pool do not need to reapply. Please note that open enrollment for the Sick Leave Pool is a separate process from UFHR Benefits’ Open Enrollment and has its own deadlines. For more information, visit the Sick Leave Pool section of the UFHR Benefits website or contact Leave Administration at (352) 392-2477 or central-leave@ufl.edu.